That's the tagline of Lowe's (LOW) new branding strategy and TV ad campaign, which kicked off Monday. But "Never Stop Improving" is more than just a tag line for the $48.8 billion home improvement chain, with 1,725 stores, Katie Cody, a company spokesperson, tells DailyFinance. The three words sum up how Lowe's shoppers think about their homes and their lives. "It's really a rallying cry and a mindset for our customers and employees saying that we're committed to never stop improving our business, customer experience and communities," she says. The campaign is designed to impart the message that shoppers are in good hands at Lowe's, which will guide them through all stages of their home improvement journey, from conception and planning to execution, Cody says. 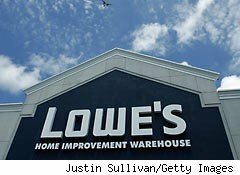 The retailer says an early test of the advertising campaign made shoppers feel inspired, motivated and energized about taking on a home improvement challenge with Lowe's. As part of the ad push, the retailer will introduce MyLowes in October, what it's calling a "revolutionary" online tool that will help shoppers manage their homes and home improvement projects. MyLowes will enable shoppers to manage home improvement tasks such as tracking store purchases, inputting product wish lists, tracking product warranty information, and storing product manuals, room dimensions, even paint color formulas, Cody says. "Never Stop Improving" replaces the retailer's "Let's Build Something Together," campaign, which debuted in 2006 and touted Lowe's as a place with a service edge and knowledgeable store associates.